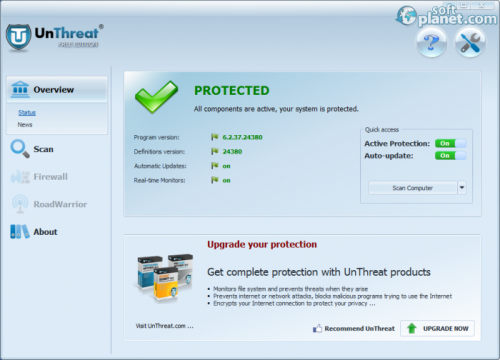 SoftPlanet makes it possible for everyone to get free UnThreat AntiVirus download directly from our servers. There is no registration needed for downloading. 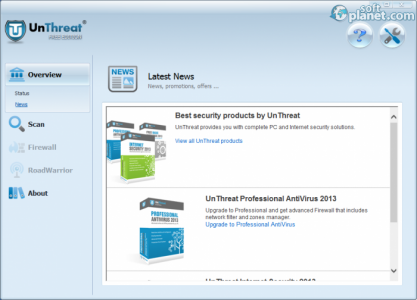 UnThreat AntiVirus Free Edition 6.2.37.24380 is a well-developed software security solution. It assures a proper protection level against viruses, trojans, malware and other possible threats. It is not some of the security alternatives that will disturb your working process. On the contrary, it works in the background and keeps your PC secured with minimum interventions on your behalf. As you have already guessed, it is absolutely free of charge. We have already mentioned that UnThreat AntiVirus Free Edition works in the background and provides you with proper real-time protection. If it detects suspicious files or any kind or online intruders it takes prompt action in order to restrict their access to your PC by throwing them inside the quarantine zone. Once they have already been “caught”, you are able to choose what you want to do with these threats. The main reason for the proper security level is its VIPRE AntiVirus engine. It allows UnThreat AntiVirus to use multiple detection methods to protect your system. It comes with three scanning modes as well - Full Scan, Quick Scan and Custom Scan. UnThreat AntiVirus Free Edition is a very good looking software application and it is probably the only one that enables you to rescale it, which comes in handy when you have lots of items within i.e. your quarantine. The interface of the app is very well-structured. Basically, you have access to most features even from the main window. The color scheme really gives you the feeling that your system is totally protected against online intruders. All transitions between the menus are very smooth. Let's talk about performance. This is where UnThreat AntiVirus really shines and stands out. First the virus definitions are frequently updated in order for your system to have up-to-date protection if there is an issue with your security shield. You are able to solve it with a single click on the button Fix it. In addition, the application works very smoothly without slowing down your PC. So basically, your system is protected 24/7 without knowing that UnThreat AntiVirus is there, unless a threat appears. Then it takes prompt action to stop it and just notifies you that the intruder is inside the quarantine zone. Thus you can take a proper measure later on. UnThreat AntiVirus Free Edition 6.2.37.24380 is a great, free and lightweight antivirus security alternative. It seems to be the perfect combination between performance, security level and price. Basically, you get top notch antivirus security for no money. So if you are looking for a free antivirus solution you definitely have to try it. Please don't hesitate to share your feedback with us in the Comments section below. 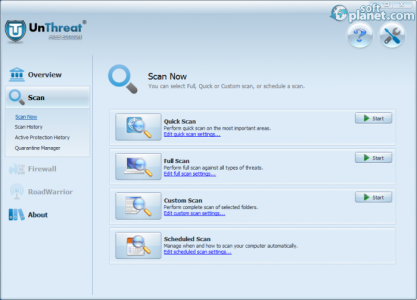 Our security scan shows that UnThreat AntiVirus is clean from viruses. The current version of UnThreat AntiVirus has been scanned by our system, which contains 46 different anti-virus algorithms. That ensures that UnThreat AntiVirus Free Edition 6.2 is 100% safe for your computer.